“Throughout this chapter, we have used a set of reference values for aerodynamic drag area. Although these values represent good approximations to the drag area of a 70-kilogram (154-pound) rider in each position, those values are not fixed. Rather, a cyclist can influence his drag area in several ways. Riding with knees close to the centerline of the bicycle frame can reduce drag area by approximately 8 percent compared with riding with knees wide apart. This knee position will affect drag similarly whether the rider uses conventional racing handlebars or aerobars. For riding with standard handlebars, arm position, including elbow bend and forearm alignment, can even more dramatically influence drag area. Bending the elbows allows the rider to lower his torso and thus reduce frontal area. Indeed, carefully positioned arms with the forearms horizontal and parallel to the bicycle can reduce drag area by up to 12 percent compared with widely positioned arms or straightened elbows. A wide-elbow position may result from poor technique, but it also may be due to poor bike fit and thus may not be within the control of the rider. Specifically, if the saddle-to-handlebar distance is too short, the rider may be forced to widen the arms so that they do not contact the legs. Consequently, drag area may be substantially increased because of a poorly fitted frame-stem-handlebar combination. Riders often ask, “How do I optimize my time-trial position?” The simple answer is, “Go to a wind tunnel and have your aerodynamic drag measured in various positions.” But, of course, not every cyclist has the opportunity to take part in wind-tunnel optimization. As an alternative, we offer several suggestions that will help riders position themselves using only a trainer and a mirror or video camera. We recommend the following procedures to establish a preliminary position before wind-tunnel testing, and this often will result in a position that is within a few percentages of the optimal drag area. Over the past 10 years, two very different approaches for optimizing aerodynamic position have been used. During the early 1990s, it was recommended that riders use a dedicated time-trial bicycle with a steep seat-tube angle (78 to 84 degrees). With bicycles like this, a low drag-area position could be achieved with a relatively formulaic procedure. Those positions are, at the present time, allowed for triathlons and by some national cycling federations. However, UCI rules currently prohibit forward seat positions. Within the current UCI rules, low drag-area positions can be achieved but the procedure is less formulaic and depends on individual morphological characteristics. To achieve a low drag position with a forward seat position, start with your current road position. You achieve the aero position by “rolling” that position forward until the torso is horizontal. Specifically, the elbow pads should be lowered and the seat should be moved forward (and slightly up) so that the body rotates about the bottom bracket and the joint angles at the hip and knee are maintained. You can use a mirror or a video camera to assure yourself that your torso is horizontal and that your relative hip, knee, and ankle angles are maintained during this procedure. This procedure usually results in seat positions that require a bicycle seat-tube angle of 78 to 84 degrees depending on body type. Taller or more slender riders tend to require less steep seat-tube angles, whereas shorter or more muscular riders require greater seat-tube angles to achieve a horizontal torso. You can achieve a similar position using a standard frame with a forward-angled seat post and a long stem. However, that configuration may result in a bicycle that may not handle well. If you are to use a forward position, we recommend that the frame be specifically designed for proper handling with that position. Once you have achieved the horizontal torso position, it has been our experience that details regarding positioning of the arms are less critical. Changing elbow-pad width (center to center) from 11 to 14 centimeters has almost no effect on total drag area, but wider positions (greater than 20 centimeters) can increase drag area by 0 to 3 percent. Similarly, arm angles (measured from horizontal) of 5 to 40 degrees have very little influence (0 to 3 percent) on drag area. The small effect of these changes on drag area suggests that, once a horizontal torso position is established, differences in arm position only affect the location of the arm’s frontal area but do not significantly affect coefficient of drag or total drag area. Cyclists must accomplish aerodynamic positioning for bicycles with conventional seat-tube angles with more subtlety. 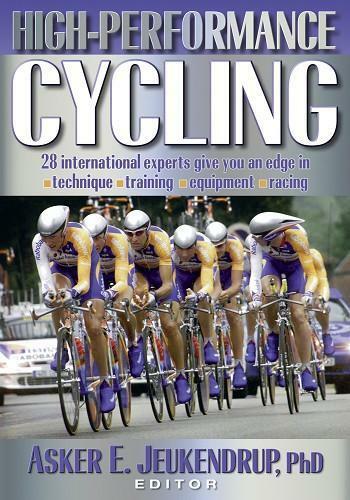 Initially, riders must learn to roll their hips over as described by Lemond and Gordis (1987). This posture can be difficult to adopt, but it is an essential element of a low drag-area position with a standard bicycle. The level to which the elbow pads can be lowered will be limited by contact between thigh and torso (which will occur at acute hip angles). Because the elbow pads cannot be radically lowered, frontal area cannot be dramatically reduced for a conventional seat-tube-angle bicycle. Rather, reductions in drag area must be accomplished with careful positioning of the hands, arms, and shoulders to reduce the coefficient of drag. Specifically, the width of the hands and elbows and the angle of the forearms are critical elements that, in an optimal configuration, act to channel airflow around the rider’s torso. Additionally, the contour of the rider’s shoulders can influence the point at which airflow separates. Rounding the shoulders and rolling them forward (i.e., protraction and downward rotation of the shoulder joint) can allow airflow to stay attached further around the rider’s body and thereby reduce pressure drag. The combined effects of redirecting (arm and hand position) and smoothing (shoulder contour) airflow around the body can reduce drag area by 10 to 20 percent. Optimized aerodynamic positions can be uncomfortable in two ways. First, by rotating the hips forward, the cyclist places pressure directly on highly sensitive areas. Additional seat padding may help to distribute that pressure but probably will not completely eliminate the discomfort. Some riders try to alleviate this problem by tilting the nose of the saddle down, but that approach will result in a tendency for the rider to slide forward, off of the saddle. That sliding force must be restrained with forces produced at the shoulders and arms that can become fatigued very quickly. Second, riders may experience muscle soreness or strain in the muscles that extend the neck. This discomfort will be reduced with training and can be ameliorated with stretching and massage. Riders often express concern that changes in position may compromise their power or efficiency. Heil et al. (1995) investigated the effects of seat-tube angle on metabolic efficiency and reported that efficiency was significantly greater with 83- and 90-degree seat-tube angles than with a 69-degree seat-tube angle. Similarly, Price and Donne (1997) reported that efficiency with an 80-degree seat-tube angle was higher than that with 68 or 74 degrees. Thus, steep seat-tube-angle bicycles should not decrease metabolic efficiency and, indeed, may improve efficiency. Conversely, Heil et al. (1997) reported that reductions in mean hip angle increased cardiovascular stress for a given power output. Such decreases in hip angle often occur when riders attempt to reduce their frontal area by lowering their elbows excessively. Therefore, you must exercise caution when adjusting your position to avoid excessive hip flexion.